The CANTY SolidSizer™ is a vision-based sensor used with the CANTY Vector System image processor for dry sand size measurement in a laboratory environment. The CantyVision™ Software accurately measures multiple aspects of the sand from area / perimeter / minor and major axis / etc. 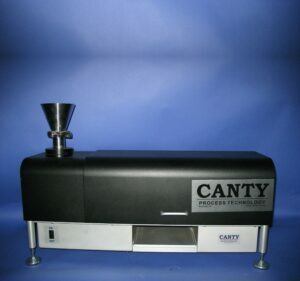 In comparison to a sieve which measures only minor axis the CantyVision™ software can correlate directly to a sieve so the customer does not have to change any QC documents. The SolidSizer™ can correlate within 2% of a sieve. A typical sieve analysis takes anywhere from 20-30 minutes including cleaning and setup for a 70-100 gram sample. On the SolidSizer™ that same sample takes less than 2 minutes. Also multiple screen distributions can be setup to accommodate multiple customers or areas in the process, hence eliminating the need for multiple runs on the same sand for different size distributions. After correlating to current methods of minor axis, customers find benefit in comparing minor axis to major axis and making sure the sand is round instead of needle shaped. Reduce lab time and make sure production samples are not skipped over due to lack of sample time available!